Faculty of Economics, University of Niš is the faculty that holds a tradition that spans over 50 years of successful existence and work. During this time 12.000 students obtained diplomas for undergraduate degrees, over 500 for a Master’s degree, 170 earned a Magistar’s degree and over 100 students acquired doctorates. The Faculty of Economics is proud of all its students! In order to strengthen the academic community, we have decided to form a group of alumni of the Faculty of Economics, with the aim to bring together all of our graduates, now successful business people and scholars and enable all of you to connect, communicate with each other, share experiences and knowledge and support our Faculty. Therefore, it is a great pleasure to invite you to cooperate with us, join us and share your story with us ! You can contact us at alumni@eknfak.ni.ac.rs and we will respond to your e-mail. 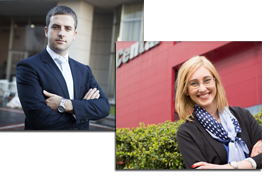 We are proud of the success of our former students and therefore we are pleased to invite you to read the stories of their successful careers.